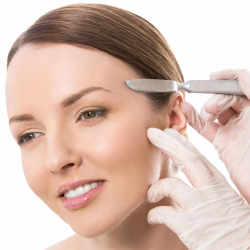 Dermaplaning is a method of exfoliation, with a small scalpel, to remove dead skin cells and vellous hair, rejuvenating skin and revealing a brighter complexion. Removing this skin and hair leaves the surface smooth ensuring makeup sits perfectly. Dermaplaning also allows for better penetration of skin products. Dermaplaning can also be used to prepare the skin for more intensive treatments such as peels. It is recommended for everyone except those with acneic skin. Client should be clear of breakouts before the treatment. It is a painless procedure with no side effects and no downtime.